Two miles of clear, mild beach along Beach Road between Oak Bluffs and Edgartown. 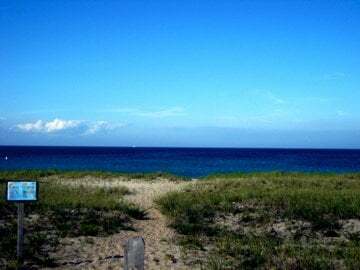 Surrounded by beautiful views of Nantucket Sound, Chappaquiddick Island and Sengenkontacket Pond, State Beach is a great spot for swimming, bathing and fishing. Gentle, shallow water ideal beach spot for families with small children. Paved bicycle path runs along the same stretch. Open to all.